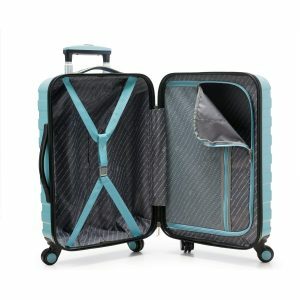 Travelers Choice Cypress is a sleek, modern and colorful, lightweight, hardshell spinner luggage set of three pieces, that is offered in charcoal, mint, pink, lavender, sand and sky blue colors. The sky blue and sand color sets cost a bit less than the first four colors on the day of this review. The suitcases in the luggage set are lightweight despite having hard side construction with better impact to resistance- can absorb the impact by flexing. They have a stylish and modern design with eight spinner wheels, side and top carry handles and a telescoping handle with an ergonomic design. You can hold the side or top handles when you wish to lift the bag horizontally or vertically, rather than rolling on its spinner wheels. The telescoping handle has a convenient push-button that lets you adjust the handle height for your comfort. The small dual spinner wheels rotate 360 degrees in all directions smoothly, and can be maneuvered easily even in tight spaces. The full interior lining has the colorful zipper trim with the elastic cross straps to keep your clothes and other items in place. The zippers on these suitcases seem to be nice looking and great quality. The smallest 22-inch cabin bag weighs 6.39 pounds with the measurements of 21.5H x 14.5W x 9D inches including the wheels and the handles. You can use it on almost all domestic and overseas flights as a carry-on bag and take it with you onto the plane and fit it in the overhead bin above you on most flights. The medium size 26-inch suitcase is 8.13 pounds and measures 25.5H x 17W x 10.75D inches. And it needs to be checked in before your passport and security control before your flight, just like the largest 30-inch spinner luggage that weighs 9.83 pounds and measures 29.5H x 19.5W x 12.25D inches. The interior measurements for the 22” cabin bag is 19.5 x 13.5 x 8.5 inches, 23.5H x 16W x 10.25D inches for the medium 26” suitcase and 27.5H x 18.5W x 11.75D inches for the largest spinner. You should receive your order quickly within a few days via Amazon.com. And you’ll get all three bags nested into each other- small into medium and medium into large. And you may want to store them this way when you’re not going away or using them. These bags seem to be very good value for money as you’re getting three nice looking, sleek, stylish and modern bags, with a sturdy construction, solid handles and spacious interiors with a few zipped pockets and cross straps and dual spinner wheels that roll very smoothly. 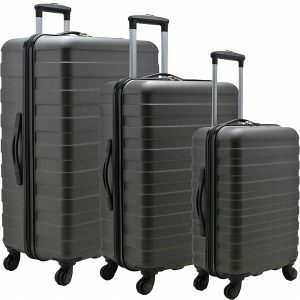 We don’t hesitate to recommend the set to anyone that is on the market for a sturdy and stylish hardshell luggage set.